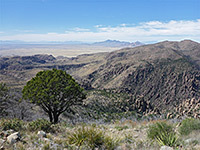 The dome-shaped summit of 7,310 foot Sugarloaf Mountain is almost the highest point in Chiricahua National Monument, second only to an unnamed ridge along the northern boundary which rises 30 feet higher, and it gives the best elevated view over the preserve. 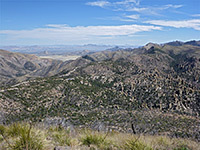 The peak is positioned between the two main ravines in the national monument - Bonita Canyon to the north and Rhyolite Canyon to the south, and the views extend for 360 degrees, across volcanic pinnacles and many other summits in the Chiricahua Mountains, to the distant lowlands of Sulphur Springs Valley in the west and San Simon Valley in the east. 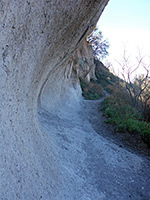 Although the path is short (0.9 miles), not too steep and has great views, relatively few people make the hike compared with the trails starting at Echo Canyon, which descend amongst the pinnacles. The summit is also the site of a single story fire lookout, which, like the trail and many other features in the monument, was constructed by the Civilian Conservation Corps in the 1930s. Sugarloaf Mountain topographic map, Chiricahua location map. The Sugarloaf parking area is at the end of a short spur forking off the main road just before Massai Point - a spacious, level area, on a ridge extending east from the mountain. 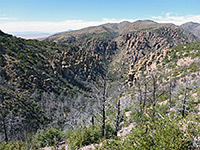 A low hill blocks views of Echo Canyon to the south, but to the north, the land is more open, falling away sharply to a wooded ravine, a tributary of Bonita Canyon. 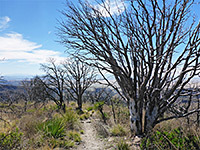 The high, exposed setting makes Sugarloaf Mountain often very windy, a condition which extends to the parking area at the start of the trail. 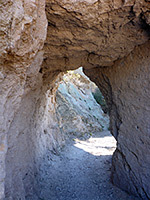 The path begins along a short saddle connecting with the east face of the peak, then traverses the northern slopes, at one point passing through a short CCC-built tunnel, through light colored volcanic tuff. Just beyond are a few pinnacles, though most of the mountain sides are relatively smooth. 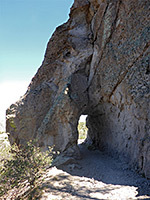 The entrance road comes into view for a while, one thousand feet below along the floor of Bonita Canyon. 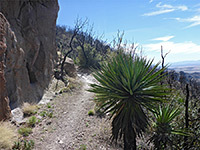 The trail passes many fallen boulders, and some patches of whitish earth, then runs along the base of a line of brownish-white cliffs, which provide shelter for a few specimens of yucca madrensis. After rounding a corner, sometimes very windy, the path proceeds southwards through a patch of fire damaged trees - manzanita and pinyon pine, and soon curves round another, sharper bend, where Echo Canyon first comes into view, lined by countless volcanic spires. The final section of the route heads eastwards, gaining height via a couple of switchbacks, up a sloping ridge to the summit, which is flat for about 70 feet. The fire lookout at the end of the trail was built in 1935; it is a small structure, 14 feet square, with a stone base and overhanging roof, and is still in use during the summer when visitors are welcome, otherwise the building is locked.